One thing bugging me though is the impact on length - since the cap of the grip will add 1/4" to 1/2", should I not adjust that 9 sw point factor? Or is that what you've already done by making it nine instead of, say, 11 (which would make sense with a 50g shaft and a rule of thumb of 5/g/sw point + one or so for tape)? No, not usually. In fact, that's one of the reasons why it's better to use the scale w/o the grip. Variations in grip cap size will effect what the swing weight scale will read with the grip installed but it usually doesn't effect the actual playing length (or effective swing weight) - which is measured to the edge of the grip cap and not the top of any dome on the grip. 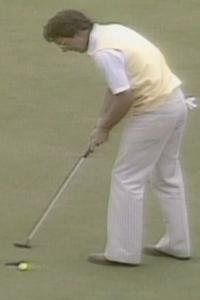 Remember, It's the edge that will generally determine where we place our hands on the grip and the effective playing length/effective swing weight, not any part that sticks up above it. The GP NDMC is a perfect example where the grip can make the scale think the club is longer than it really is and therefore the SW heavier than it really is. Ah - that makes sense. Thank you! Can someone explain the difference between the Titleist Surefit performance guide and the information in this thread? According to this thread, if you cut your driver down 1” and want to retain the same swing weight, you would need to add 12 grams. The Titleist Surefit page says for 1” under the recommend weight is 4 grams heavier to produce the standard swing weight. What am I missing here? I've always been told 1.5g per SW on driver, 2gr per SW on 7i, and 3g on SW on LW. I do know when I cut my LTD down a while back .5" it went from ~D4 to ~D0 and I added ~5g of weight and it came up to ~D3.5 or so. I am looking at picking up another sole weight at 7g to add. By looking at the calculations this should bring me back to D3.5. Or will it be slightly lower due to the counter balance? If so, how much weight do I need to get the club back to my desired SW? No. The new thread was a better idea. But if your "desired" SW wasn't determined with the exact same shaft model, shaft weight and playing length - then you shouldn't be overly focused on that particular SW value. You need to do a little testing to find out what the best SW is for this particular combination.